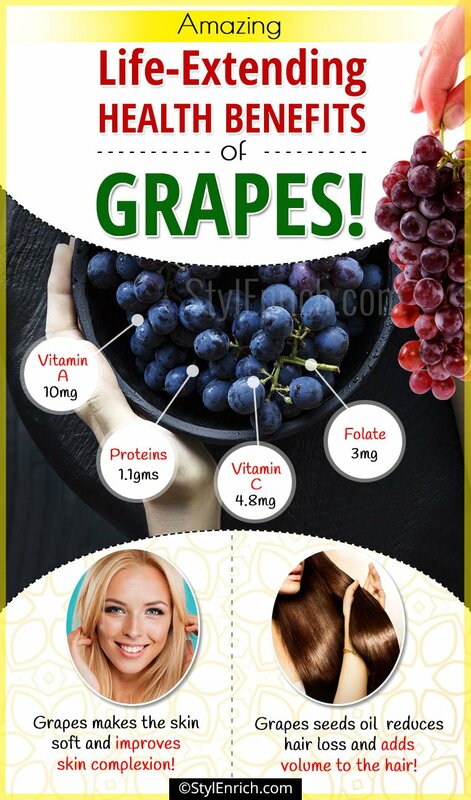 Health Benefits of Grapes : Amazing Fruit For Body, Skin And Hair! Amazing Life-Extending Health Benefits of Grapes! When we welcome the New Year, so do we welcome grapes. Grapes are the first fruits that are available in plenty during the onset of New Year. Grapes fall under the family of berries and are mainly categorized into three main variants- green, purple and red. Grapes are renowned as a primary ingredient in the wine making process and can be added in almost anything. Be it desserts or fruit salads, grapes can transform any dish. Hence they are popularly known as the “Queen of Fruits”. In this article, we will know about the health benefits of grapes in detail. This wonderful fruit not only adds flavor and taste but is highly beneficial for your health too. Being rich sources of vitamins and essential minerals, the health benefits of grapes are plenty. Grapes due to their high nutritional value play a major role in ensuring a active and healthy life. When you are affected by sunburn and your sunscreen does not come to much use, then you can use grapes for your rescue. Grapes are rich in anti-oxidants resveratrol and proanthocyanidins that reduce the damage caused due to UV rays and excessive skin exposure. Apply mashed grapes and leave on for about 30 minutes and wash off with cool water for best results. One of the best advantages of red grapes nutrition is its anti-aging properties. Red grapes reduce the free radicals that cause fine lines and wrinkles on the skin. Rubbing the red grape pulp on the face for about 15 minutes can help reverse aging. 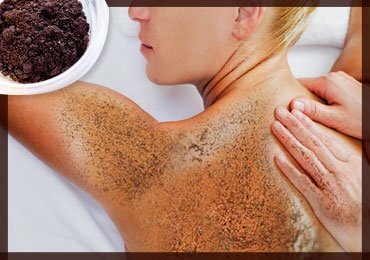 Grapes treatment is considered better than any other anti-aging treatment. Grapes are loaded with Vitamin C and vitamin E which help in reducing blemishes and acne scars. 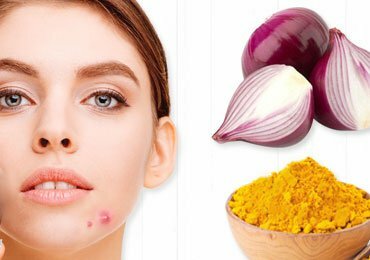 It also makes the skin soft and improves skin complexion. If you are traumatized by hair fall, then a paste of seeded grapes will help reduce hair loss. The grape seed oil and linoleic acid reduces hair loss and adds volume to the hair. Grape pulp can be mixed with chickpeas and fenugreek and used as a hair mask. This hair masks improves the lustre and gives strength to the hair. Grapes are rich in anti-oxidants, and Vitamin E which improves blood circulation on the scalp, reduces itchiness and controls dandruff. Research indicates that including grapes in your daily diet has many benefits for your overall health. Some of the overall health benefits of grapes. Grapes are rich in anti-oxidants “flavonoids” that prevent the oxidation of LDL that blocks the blood vessels of the heart and cause coronary disorders. Flavonoids are also responsible for imparting the color that grapes have. The 2 main types of flavonoids found in grapes are quercetin and resveratrol which counteract the negative effects of free radicals on the arteries. These 2 flavonoids filter toxins from the blood and reduce platelet clumping. Owing to red grapes nutrition, it is rich in micronutrients like manganese, copper and iron which are essential for the strengthening of the bones. Consuming grapes regularly can prevent age-related bone disorders like osteoporosis. Manganese aids in nervous system functioning, protein metabolism, and collagen formation. The grapes vitamins can help eliminate uric acids from the system and decrease the pressure on kidneys. Since grapes have high water content, they increase urination which has an indirect effect on the elimination of uric acid from the body. Grapes are rich in antioxidants and due to its hydrating properties have a cleansing effect on the body. Grapes are rich in polyphenols like Resveratrol that decreases the levels of amyloidal-beta peptides in patients having Alzheimer’s disease. Grapes are also known to enhance brain health and reduce the occurrence of degenerative neural disorders. Grapes are highly known to improve brain function in those suffering from mild cognitive impairment. Red grapes nutrition plays a major role in the prevention of cancer. It has strong anti-cancer properties due to resveratrol. The anthocyanins and proanthocyanins have anti-proliferation properties that inhibit the growth of cancer cells. The pigments present in grapes also increase the overall immunity of the body and protects it from diseases. Grapes contain a compound called pterostilbene which is known to reduce blood cholesterol levels. Pterostilbene is a flavonoid and antioxidant that has a great impact on blood cholesterol. The skin of the grapes contains a compound called saponins that bind to the cholesterol and prevent its absorption in the body. Eating grapes on a regular basis keeps mineral and iron levels balanced in the body. Red and green grape juice extract is known to be a great treatment for those suffering from Anemia. The sugar content in grapes provides instant energy to the body and fights fatigue. For those suffering from dyspepsia, grapes vitamins play a very important role in curing this order. Grapes also cure irritation and indigestion in your stomach. Grapes are generally considered as “Light foods” and are preferred over other digestive aids. Grapes are best consumed when they are fresh. It is always best preferred to purchase fresh grapes from the fruit market. Unwashed grapes should be kept in an airtight container or a zip-lock plastic bag. Grapes can be stored in a refrigerator for about a week, after which their quality diminishes and they decay. Prepare your own fruit cocktail with fresh fruits like pineapples, peaches and strawberries. Include grape juice extract and sprinkle a small amount of honey into the cocktail. Freeze grapes and eat them after a meal on a hot sunny afternoon. Slice grapes and add them to your fruit salad, vegetable salad and chicken salad. Extract grape juice and make wine out of it for your favorite parties. Grapes being the wonder fruits have several interesting properties that are not known to everyone. Some of the interesting and beneficial properties of grapes are. Grapes are rich in phytonutrients that play a role in increasing longevity of life. Grapes have low glycemic index and is the most preferred food for diabetics. Similar to blueberries, grapes are covered by a whitish bloom like skin or outer covering. Grapes that are eaten raw as is or used in food recipes are known as table grapes. Those grapes used to make wine are generally purple and are called wine grapes and those grapes that are used to make dried fruits are called raisin grapes. We have seen Health Benefits of Grapes. In conclusion, grapes play a very important role in treating several health disorders of the body, skin and hair. They are considered to be the best home remedy for several ailments. In general, grapes are extremely nutritious and increase the overall immunity of the body. In addition, grapes are versatile fruits that can be easily transformed as per preference and can satisfy the taste buds in every way. 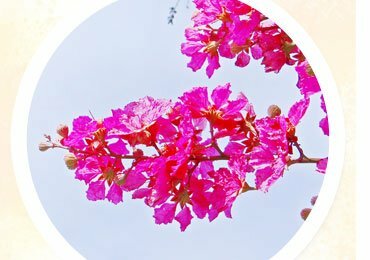 Health Benefits of Queen Flower Plant! 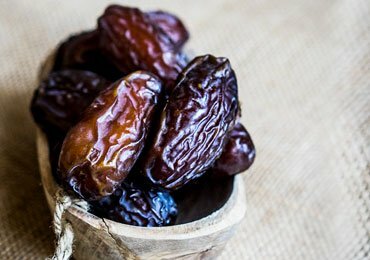 Couple Of Dates A Day Can Give Amazing Health Benefits! 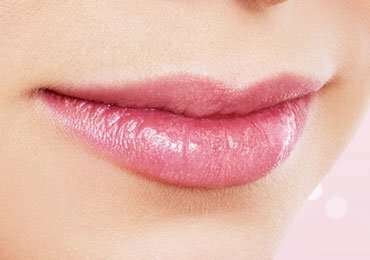 How to Treat Chapped Lips Using Home Remedies? 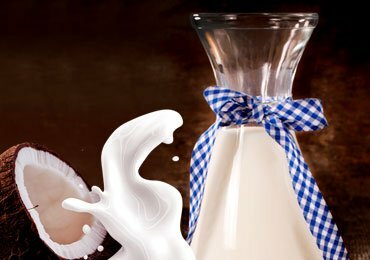 Vegan Milk Benefits : Amazing Dairy Replacement for Vegan People! 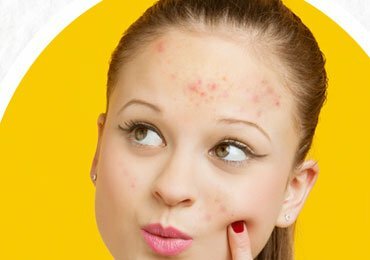 How To Get Rid Of Heat Boils Naturally? 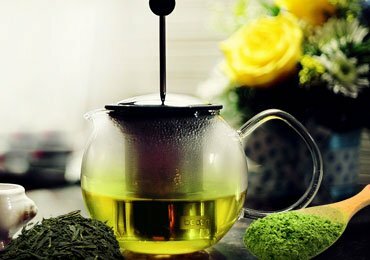 How Green Tea Is Prepared For Weight Loss? 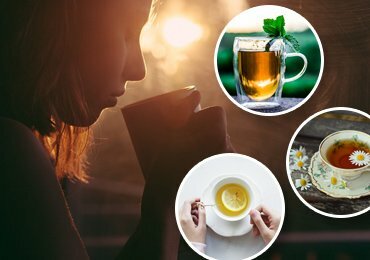 Tea For Sore Throat : The Best Choice For Healing! How to Lose Stomach Fat Fast Effectively? A very best commentary on grapes fruits. It is really good for health conscious people. Anti aging properties are much valued in beauty products. Enjoyed very much going through this article.